With quality coffee available to purchase on every high street, consumer’s standards are continuing to rise, with the spotlight on every component of the drink – especially the milk. As the top three hot drinks for UK consumers are currently lattes, cappuccinos, and hot chocolate, milk is a key ingredient when it comes to delivering the good quality taste, texture, and appearance that consumers have grown to love and expect. Making coffee with plant- based dairy alternatives can cause frustration for baristas – they can split and destroy the much-loved, carefully crafted patterns on the top of drinks. Lactofree however shows no visual difference to standard fresh milk, ensuring a high-quality finish. It steams and foams consistently with no splitting and it creates the small tight microfoam, which is required to achieve the intricate latte art that consumers love. The simple reason for this is because it contains the same level of fat and protein. Only the lactose is filtered out. The importance of milk is something all true coffee lovers know well, and Arla believes that no customer should have to compromise on the quality of that anticipated latte with breakfast, or a smooth foamy cappuccino at lunch. 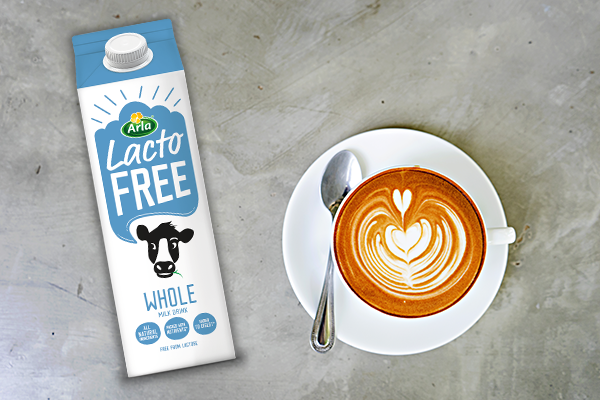 Arla Lactofree ensures no taste impact vs. standard milk ensuring the brilliant coffee beans you use shine through and aren’t masked by any additional flavours. ‘The coffee industry has seen significant growth over the last few years, and milk has played a real part in turning coffee into something that can be universally appreciated, not only for the taste, but for the variety of what you can do with it, especially with latte art.